Surrey members have been fortunate to witness a number of spectacular batting efforts at The Oval by potential England cricketers this season, but it is Jason Roy, not Kevin Pietersen, who is likely to be missing a large chunk of county games due to international commitments this summer. 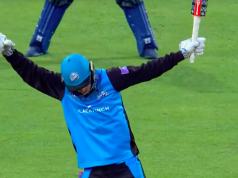 The middle order powerhouse is predicted to be included in England’s limited-overs squad for the series against New Zealand, and in doing so, will be away from his county for at least three Championship and three T20 Blast matches. On the evidence of today’s unabashed innings, where Roy hit a career-best 143 to help move Surrey from an overnight score of 145/4 to 310/5 in the space of 34.3 overs, his absence will be keenly felt as they pursue promotion. A call-up is the least Roy deserves, though, after an uneventful if nonetheless joyful England ODI debut in a washed-out fixture with Ireland last month. And it will not be long before he is viewed as more than a short-format specialist. While one-day and T20 cricket has brought the wider public’s attention to the batsman cause, it is in first-class cricket where he is realising his full potential. A 2013 four game spell returned miserly figures of 49 runs, but a spurt last season gave greater rewards, striking over 1,000 first-class runs for the first time. He is already past 500 this term, and following an innings he proclaimed as his best for Surrey, there is no reason he cannot attain higher international accolades. It is all down to simplicity. “It’s a game of confidence,” Roy said. “When I’m batting I’ve got no real plan of what I want to do, I just bat.”. A late evening charge on the first day alongside Steven Davies, another man pushing his case for an England spot, continued this morning with the arrival of the sun and warmer, albeit still blustery, conditions. In their last Championship game here against Leicestershire, the pair smashed 145 in 11.1 overs, opening up the second innings in a 26 over dash to the winning target of 216. Although they did not go at quite the same rate, only 33 balls were required in the morning to get the 29 runs to reach their 100 partnership milestone. Three overs later and Roy brought up his half-century, with a back foot punch off Bailey to the ropes through cover. It was a majestic knock, combining poise, power and confidence – a scary proposition for any bowler to combat, especially against a batsman with the array of shots Roy possess. Amid the hurrah, Davies played a consolidated innings compared to the sweet shots witnessed the day before, his half-century still coming in 68 deliveries. At this point Roy let lose, pulling Kyle Jarvis ferociously through midwicket for four, and, after passing 3,000 first-class runs, sent Simon Kerrigan for two sixes and a four in one over. The spinner was to be reminded of his previous game here, when on England debut he was deposited around the ground, Roy this time straight driving and then cutting him to the boundary to bring up his second Championship century of the season. Lancashire suffered further while waiting for the new ball, Roy scoring a century in the morning session, a feat not achieved by a Surrey batsman since 1990. Once it did arrive, the visitor’s graft began to pay, Roy departing first glancing Jarvis to Ashwell Prince at gully, prior to Davis nipping Tom Bailey to Paul Horton for 86. Smiles wore off quickly though, as Ben Foakes, on debut with Gary Wilson away for Ireland, glided around the crease driving and pulling effortlessly. Partnered by Gareth Batty, the pair put on 78 to gain full batting points, before the captain fell lbw to Jordan Clark. He would account for Tom Curran, aided by a masterful catch by Alex Davies down the leg-side, before darkness and gloom ended their day prematurely.